Of Discs: 1 disc(s) Studio / Label: Bis UK Release Date: 26 Apr 2011. Disc 1 25 Nun Hilf Uns, Herr, Den Dienern Dein. 1.05 mins. Disc 1 23 Heil Und Segen. 5.24 mins. Disc 1 22 Auf! Du Geliebte Lindenstadt. 1.15 mins. Johannes Brahms : Dances to a Black Pipe CD (2011) NEW Title: Dances to a Black Pipe Artist: Johannes Brahms Genre: Classical|Chamber Format: SACD No. of Discs: 1 disc(s) Studio / Label: Bis UK Release Date: 31 Oct 2011. 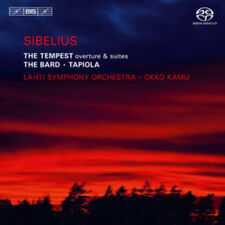 Jean Sibelius : Sibelius: The Tempest/The Bard/Tapiola CD (2011) NEW Title: Sibelius: The Tempest/The Bard/Tapiola Artist: Jean Sibelius Genre: Classical|Orchestral Format: SACD No. of Discs: 1 disc(s) Studio / Label: Bis UK Release Date: 30 Aug 2011. 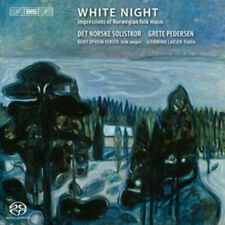 Eivind Groven : White Night CD (2011) NEW Title: White Night Artist: Eivind Groven Genre: Classical|Vocal Format: SACD No. of Discs: 1 disc(s) Studio / Label: Bis UK Release Date: 28 Feb 2011. Disc 1 18 Bruremarsj Fra Valsoyfjord - Aure 3.37 mins. Disc 1 1 Asgaardsreien, Op. 10 10.25 mins. Ole Olsen : Ole Olsen: Symphony No. 1/Trombone Concerto/Asgaardsreien CD (2011)Title: Ole Olsen: Symphony No. 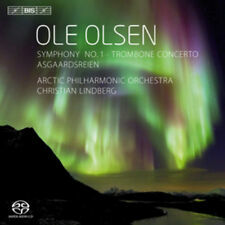 1/Trombone Concerto/Asgaardsreien Artist: Ole Olsen Genre: Classical|Orchestral Format: SACD No. 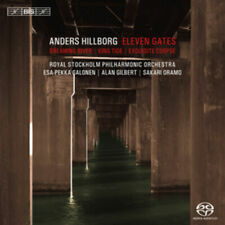 Anders Hillborg : Anders Hillborg: Eleven Gates CD (2011) NEW Title: Anders Hillborg: Eleven Gates Artist: Anders Hillborg Genre: Classical|Orchestral Format: SACD No. of Discs: 1 disc(s) Studio / Label: Bis UK Release Date: 30 Aug 2011. Max Bruch : Bruch/Vadim Gluzman: Violin Concerto/Romance CD (2011)Title: Bruch/Vadim Gluzman: Violin Concerto/Romance Artist: Max Bruch Genre: Classical|Concerto Format: SACD No. of Discs: 1 disc(s) Studio / Label: Bis UK Release Date: 26 Apr 2011. Of Discs: 1 disc(s) Studio / Label: Bis UK Release Date: 07 Feb 2011. Disc 1 6 Blanik 13.10 mins. Disc 1 5 Tabor 13.09 mins. Disc 1 4 Z Ceskych Luhu a Haju 12.31 mins. Disc 1 3 Sarka 9.42 mins. Disc 1 2 Vltava 12.14 mins. Franz Schubert : Schubert/Tchaikovsky/Bruch CD (2011) NEW Title: Schubert/Tchaikovsky/Bruch Artist: Franz Schubert Genre: Classical|Concerto Format: SACD No. of Discs: 1 disc(s) Studio / Label: Bis UK Release Date: 30 Aug 2011. Wolfgang Amadeus Mozart : Mozart: Piano Concertos CD (2011) NEW Title: Mozart: Piano Concertos Artist: Wolfgang Amadeus Mozart Genre: Classical|Concerto Format: SACD No. of Discs: 1 disc(s) Studio / Label: Bis UK Release Date: 04 Jan 2011. Richard Strauss : Strauss: Ein Heldenleben CD (2011) NEW Title: Strauss: Ein Heldenleben Artist: Richard Strauss Genre: Classical|Orchestral Format: SACD No. of Discs: 1 disc(s) Studio / Label: Bis UK Release Date: 27 Jun 2011. Of Discs: 1 disc(s) Studio / Label: Bis UK Release Date: 04 Jan 2011. Disc 1 4 Andante. 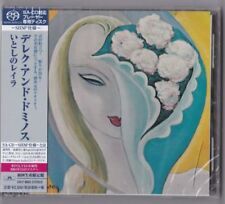 Disc 1 2 Adagio. Disc 1 6 Allegro. Disc 1 7 String Trio in B Flat Major, D471. Of Discs: 1 disc(s) Studio / Label: Bis UK Release Date: 26 Sep 2011. Disc 1 23 Lass Uns Das Jahr Vollbringen. 1.58 mins. Disc 1 22 Und Da Du, Herr, Gesagt 1.44 mins. Disc 1 19 Herr, So Weit Die Wolken Gehen. 3.54 mins. Hector Berlioz : Berlioz: Symphonie Fantastique/Cleopatre CD (2011) NEW Title: Berlioz: Symphonie Fantastique/Cleopatre Artist: Hector Berlioz Genre: Classical|Orchestral Format: SACD No. of Discs: 1 disc(s) Studio / Label: Bis UK Release Date: 28 Feb 2011. Title: Portraits. Condition: New. Missing Information?. Sub Genre: Vocal. Genre: Classical. Of Discs: 1 disc(s) Studio / Label: Bis UK Release Date: 28 Mar 2011. Disc 1 24 Chaconne 13.57 mins. Disc 1 35 La Semaine Grasse 7.55 mins. 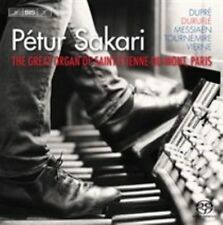 Disc 1 34 Chez Petrushka 4.44 mins. Disc 1 33 Danse Russe 2.29 mins. 1-1 Piano Concerto No. 1 in C Minor, Op. 35 1-2 Adagio 1-3 Presto 1-4 Rondo in C Major, K373 1-5 Allegro 1-6 Andante Cantabile 1-7 Rondeau. Andante Grazioso - Allegro Ma Non Troppo 1-8 Adagio in E Major for Violin and Orchestra, K261 1-9 Piano Concerto No. 1 in C Minor, Op. 35 1-10 Andante 1-11 Rondeau. Title: Beethoven: Piano Concertos 4 & 5. 1-1 Piano Concerto No. 1 in C Minor, Op. 35 1-2 Andante Con Moto 1-3 Rondo. Vivace 1-4 Allegro 1-5 Adagio Un Poco Moto 1-6 Rondo. Allegro, Ma Non Troppo. Genre: Classical. Title: Im Herbst. 1-1 He, Zigeuner, Greife in Die Saiten Ein! Condition: New. Studio: Bis. Sub Genre: Choral. Genre: Classical. Title: Bach/Busoni: Chaconne/. 1-24 Chaconne. Genre: Classical. Condition: New. 1-33 Danse Russe. 1-32 Epilogue. 1-29 Presque Lent. 1-28 Assez Animé. Title: Sebastian Fagerlund: Isola. Condition: New. Missing Information?. Misterioso 1-6 Risonanza. Furioso 1-7 Preghiera. Intenso 1-8 Introduzione 1-9 Agitato Capriccioso. Sub Genre: Orchestral. Genre: Classical. Title: Chopin: Fantaisie in F Minor/Ballades/Mazurkas/Nocturnes. Genre: Classical. Condition: New. Catalogue Number: 7318599918389. Format: CD. Artist : Tapiola Sinfonietta. Title: Weber: Overtures. Title : Weber: Overtures. Format: SACD,Hybrid SACD. Format : SACD,Hybrid SACD. Condition : Very Good. 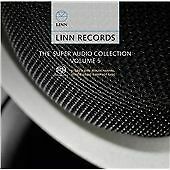 Product Category : Music. Release Date : 2011-08-01. Artist: Vadim Gluzman, M. Bruch. Format: SACD. Title: Violin Concerto No 1 / Romance. Quintet for Strings, in A minor: 1. Quintet for Strings, in A minor: 2. Allegro Molto. Quintet for Strings, in A minor: 3. Title: Peter Mattei: Great Baritone Arias. Condition: New. Missing Information?. 1-15 Deh, Vieni Alla Finestra. Sub Genre: Vocal. Genre: Classical. Release Date: 2011-04-26. Andrew Litton, John Ringer - Rite of Spring / Petrushka [New SACD]. Title: Rite of Spring / Petrushka. Artist: Andrew Litton, John Ringer. Format: SACD. Title: Borodin/Rachmaninov/Shostakovich: Cello Sonatas. Condition: New. Missing Information?. 1-1 Lento - Allegro Moderato 1-2 Allegro Scherzando 1-3 Andante 1-4 Allegro Mosso 1-5 Allegro 1-6 Pastorale. Title: Isola. Format: SACD. Condition: New. Artist: Masaaki Suzuki, J.S. Bach. Title: Cantatas 48. Format: SACD. Cantata No. 120, 'Gott, Man Lobet Dich in Der Stille,' BWV 120 (BC B6): 5. Cantata No. 120, 'Gott, Man Lobet Dich in Der Stille,' BWV 120 (BC B6): 6. Artist: Tapiola Sinfonietta, C.M. Weber Von. Title: Overtures. Format: SACD. Artist: Yannick N zet-S guin. Title: Symphonie Fantastique / Cleopatra. Symphonie Fantastique for Orchestra ('Episode de la Vie D'un Artiste. en Cinq Parties'), H.48 (Op. 14): 1. Symphonie Fantastique for Orchestra ('Episode de la Vie D'un Artiste. en Cinq Parties'), H.48 (Op. 14): 2. Release Date: 2011-08-01. Number of Discs: 1. Title: Ma Viast. Format: SACD. Condition: New. Artist: Alexander Chaushian. Format: SACD. Title: Russian Cello Sonatas. Sonata for Cello & Piano in G minor, Op. 19: 1. Lento - Allegro Moderato. Sonata for Cello & Piano in G minor, Op. 19: 2. Allegro Scherzando. Title: Ein Heldenlebenen. Artist: Yannick N zet-S guin, R. Strauss. Format: SACD. Artist: Maxim Rysanov. Title: Maxim Rysanov Plays Schubert, Tchaikovsky, Bruch. Format: SACD. Artist: Ronald Brautigam. Format: SACD. Title: Complete Works for Solo Piano 10. 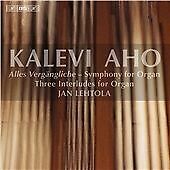 SACD, Hybrid, Multichannel, Album. Dances To A Black Pipe. 3 Hungarian Dances - No. 12 Presto. 5 Hungarian Dances - No. 1 Allegro Molto. 6 Hungarian Dances - No. 21 Vivace - Più Presto. 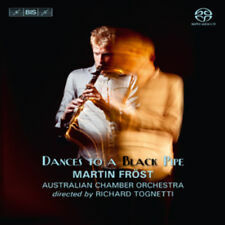 Martin Fröst, Australian Chamber Orchestra. 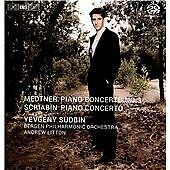 Extra-Infos: Yevgeny Sudbin. Format: SACD. Sound format: Hybrid SACD - DSD. "Paraphrase ber Walzer Nr. 6 Des-Dur op. 64 Nr. 1 "Minutenwalzer" von Chopin". Label: Bis. Condition: new. Anders Hillborg - Eleven Gates (Sacd). Format: CD. CategoriesVinyl CD DVD Blu-Ray MC/Cassette. 100% Satisfacción garantizada! 30 Días Garantía de Devolución de Dinero. Los gastos de envío para la restitución a su cargo. Format: SACD. Sound format: Hybrid SACD. Label: Bis. Condition: new. Rondeau: Presto". We will do so too. We'll strive to resolve your problem. We will dispatch the product after receiving the money.